Need a new sandwich idea? Tempeh can be an acquired taste, but add swiss cheese and raspberry jam for a delicious tempeh sandwich for a healthy lunch option. Jenna Weber shares why tempeh sandwiches are her favorite in a full post on the Fresh Tastes blog. Top four of the slices with a piece of Swiss cheese and two thin slices of tempeh. 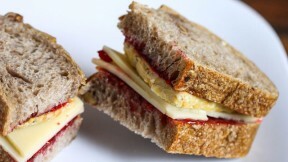 Top each with another slice of bread smeared with jam.